I left Saguaro after 10th grade. Moved to Tucson and graduated from Salpointe Catholic H.S. Traveled with Up With People in '79- '80 for one year and played drums in the band. My wife Laureen was a singer and dancer in the group and after four years of a long distance relationship we got married and I moved to Alberta, Canada. I studied music at Grant MacEwan College from 84-86 and up untill 3 years ago was a full time professional freelance musician and instructor at Red Deer College in the music dept. After 25 years, we've decided we've had enough of these winters and we are moving back to Tucson at the end of June. Music is still a huge part of my/our life and Laureen and I have managed to influence our kids with our passion. 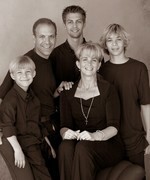 My son Nick plays drums, Chris plays guitar an piano and sings, Laureen sings and I sing and play bass. Alex loves the bongos. We all get together and jam once every couple of weeks and it's a real gas. I am currently enjoying my carreer as a successful network marketer in the Personal Development industry and a part time career as a professional drummer. Life is amazing! OK, here's my story. . .
Do you remember the Far Side Comic about Roger, the orchestral cymbal player? (Roger is saying. . . "This time I won't screw up. . .I won't screw up") If your not familiar with that comic please Google it. I'm gonna ask all my band mates to be gentle with me here. . .
We were in the auditorium rehearsing on stage and well, I was playing cymbals. . . I'll leave the rest to your imagination. Anyways, the caption for the comic reads: "Roger screws up." DEAN PIERNO has a birthday today. DEAN PIERNO posted a message on Kelly Kendall's Profile. My favorite fishing hole. . . Nice catch Alex! Alex- Green Belt in Tae Kwon Do.